Are you busy with the preparation of "healthy" foods, do you plan menus for days in advance, are you burdened by "healthy food", what happens if you eat little less healthy from "suspicious boxes" bought at the supermarket - how you feel then? These are just some of the questions that occupy nutritionists around the world, and this new eating disorder known as orthorexia nervosa disturbed the public and caused lots of controversy. Of course, we all need to be careful about what we eat, because it is definitely the key to good health, but if you are too much burdened with every bite – you have a serious problem. "Ortorexia nervosa," a term first used by physician Steven Bratman, in an article written by the Yoga Journal magazine way back in 1997, certainly cranked up the dieticians and nutritionist, but not only them. It was not a traditionally recognized eating disorder, although it has some characteristics of anorexia and bulimia, as its basis is also obsession with food. What are the symptoms of orthorexia and how to recognize it? Orthorexia nervosa involves fixation solely on the "clean", "right" or proper "food before the very amount consumed. Doctor Bratman gave a lot of attention to this problem when he faced it himself, that is after he started obsessively eating only so-called healthy foods. Otherwise, lately, more people dismiss almost the entire food groups from their diet, considering that this is the only way to always be healthy and full of "positive" energy, this is becoming a trend globally. Women of 40-50 years who want to look like girls of 18 years, are nothing new and unusual, you will agree - you see it on social networks almost daily. Exclusivity is worst of it all so therefore, before proceeding to a drastic diet, be sure to consult with a physician nutritionist. Simply not everything is for everyone, but not when it comes to healthy food. For example, not all people can eat only raw food, because their body simply cannot digest it. Do you think of a healthy diet for more than three hours during the day? What is more important nutritional value of each meal or enjoying during the consumption of the same? Has your quality of life decreased with the increase of the quality of the food? Are you tougher and more severe to yourself in the last period? Is your self-confidence bigger when you know that you eat healthy? Do you give up on foods you have previously enjoyed because of the benefits of these – “real" foods? Do you find it difficult to eat out because of the aforementioned diet and does this keep you away from friends and relatives? Do you feel anxiety and guilt when you break your own rules in the diet? Are you filled with complete tranquillity and gentle pleasure because of the fact that you now have a complete control over your daily diet? If you answered yes to four or five questions from this test - you are on a threshold of orthorexia, which means that it is a high time to relax and stop bothering or thinking about healthy food. If your answer is "yes" to all questions, then you are completely obsessed with a healthy diet and your diagnosis is orthorexia nervosa. How common is orthorexia nervosa among the population? Unclear is the boundary that separates "normal" healthy eating from disorder such as orthorexia, but it refers to a situation when the transition to exclusively healthy diet causes great stress or carries with it serious consequences. These people believe that they did something wrong just because of eating a piece of food that is not included in their “healthy” diet and that makes them quite upset. After that they eat exclusively super healthy "fancy" foods, for example, various seeds and fresh green vegetables. Also they like to eat only at home, where they have complete control when it comes to diet without anyone imposing something else. This behaviour often violates their connections with family and friends, who mostly are not aware about their mental state. Orthorexia nervosa has not been recognized until now as a clinical eating disorder, but researchers have compiled a tested questionnaires in different environments in order to get an approximate idea of ​​its presence among people. Italian researchers have developed their questionnaire known as ORTHO-15 in 2005, and some of the questions we have already mentioned. Suppose that orthorexia nervosa is not on the list of manuals for diagnostics and statistics of the Association of American psychiatrists (known as DSM-5), which psychiatrists and psychologists use today, to detect mental disorders. List DSM-5 currently identified anorexia, bulimia, binge emotional overeating, as well as other specific disorders of nutrition and nonspecific eating disorders ". Orthorexia nervosa is therefore closer to compulsive work disorder - complete dependence on the work or intense exercise, e.g. exaggerating to the point when you become obsessed with some activity. 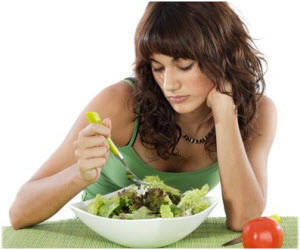 Orthorexia nervosa is often confused with a lot "more famous" anorexia due to several common results. Most people suffering from orthorexia show a desire for weight loss and look generally lean to a similar extent as anorexics. Orthorexics are also isolated from the environment, which makes them depressed and constantly tense. Finally, orthorexia nervosa causes dramatic weight loss and extreme obsession to consume only healthy foods. It is interesting that people with orthorexia feel superiority due to their perfect discipline in their diets and their food is an almost sacred ritual. Food can be chewed fifty times or more, and most often consumed is a healthy fruit or fresh food. When people make the slightest "offense" - say, eat a ball of ice cream – they almost always feel guilty. Then be sure that they will follow self-punishment, which is usually in the form of more stringent diet or on the other side overeating. As in the case with other obsessive disorders, orthorexia nervosa can lead to extremes, and it is characterized with sudden mood swings, but also frequent arbitrary isolation. These people spend most of their life planning and preparing healthy meals, and resisting the various temptations. It can go to extremes, and start to avoid specific or previously "loved ones" just because they do not share their beliefs about nutrition or do not have the habit to carry a supply of "healthy" food everywhere. How is this eating disorder treated? Like other eating disorders, orthorexia nervosa can have very negative consequences - a complete social isolation, physical decline, inability to enjoy life as before and so on. There have been several deaths associated with orthorexia, and this is when a person due to a restrictive diet and fasting loses weight so much that the heart just gives up. When it comes to the treatment of orthorexia, doctors are not always so well informed about this condition as with other disorders, recognizable and clinically defined. However, specialists in eating disorders are becoming more aware of this condition, so they can provide treatment to those whose life revolves around food. Treatment of orthorexia includes that the patient again develops awareness about food and physical appearance. This can be achieved in the therapy or support groups. In extreme cases, when orthorexia nervosa has indeed taken its hold, hospitalization is necessary. Listen to the advice of Dr. Bratman, who says: "Never let food become the most important thing in your life." Instead of eating your kale yourself, it would be better to share a drink with friends. Try to balance the consumption of food with a famous mantra "Basically, and sometimes I eat.